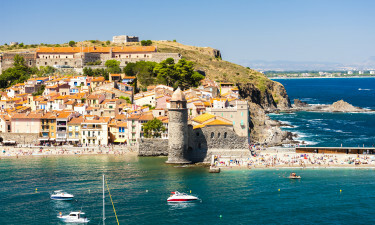 Nestled between the magnificent Pyrenees and the Mediterranean Sea, the Languedoc & Rousillon region is a natural paradise that offers countless opportunities for sightseeing and the perfect environment for a special camping holiday. Speak to the luxury camping specialists at LUX-camp to find out more about the region's highlights or to book your perfect camping getaway. Why should I camp in Languedoc & Rousillon? Geographically speaking, this region is incredibly diverse, as the landscapes go from the imposing peaks of the Pyrenees to sun-drenched vineyards and valleys that eventually give way to beautiful sandy beaches. Medieval castles, walled towns, and hilltop villages dot the entire region. In short, boredom is never an option during a camping break in Languedoc & Rousillon. Le Brasilia is a luxury camping site that boasts an unbeatable location directly on Canet beach. Everything in this campsite is geared towards relaxation, from its stylish mobile homes and luxury cottages to its Polynesian-style waterpark and spa. This five-star camping site is perfect for camping enthusiasts in search of a luxurious stay surrounded by nature. Nouvelle Floride offers first-class accommodation for couples and families in seaside bungalow tents and fancy air-conditioned cottages. Key amenities include a wellness centre offering massage therapy and beauty treatments and a comprehensive leisure programme ran by friendly professionals. A prime beachfront location, a range of high-end accommodation options, and proximity to a natural reserve are the key highlights of this award-winning 5-star campsite. Serignan Plage is within easy reach of Beziers and accommodation is available in the form of wooden chalets, luxury mobile homes, and beautifully appointed 2-bedroom tents. Beach lovers are well catered for in Languedoc & Rousillon, as some of the top French beaches are located within the region. There are more than 40 Blue Flag beaches along the Languedoc-Rousillon coastline, and many others await to be discovered. 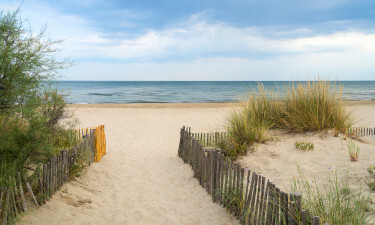 Some of the top local beaches include Canet Plage, Portiragnes, Leucate, La Franqui, Argeles, and Espiguette. The region's rich history is reflected in its urban landscapes, as Languedoc & Rousillon is home to several historic towns and cities that have preserved their distinct heritage for centuries. Some of the urban highlights of this region include Montpellier's elegant classical buildings, Bezier's scenic river setting, the impressive walled town of Carcassonne, and the beautiful canals in Perpignan. 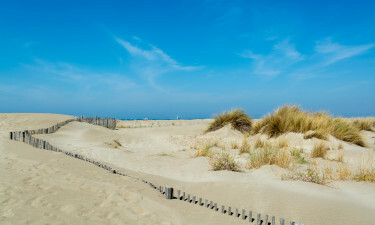 Top attractions include the UNESCO site at Canal du Midi (cruise trips available), the castles at Cathar country, the African safari park of Sigean, the scenic tourist train ride known as Le Train Jaune, the seaside towns of Sete and Adge, and the mountain landscapes of the Cevennes National Park. 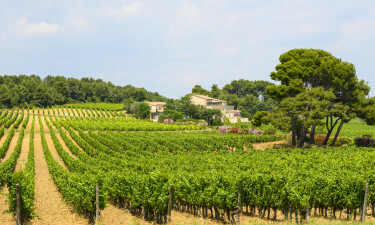 The Languedoc & Rousillon region is blessed with a pleasant Mediterranean weather and with more than 300 sunny days a year. Spring and autumn are especially beautiful here and the perfect time for a camping holiday. Local specialties range from filling stews and casseroles like casssoulet or ollada to flavourful fish and seafood dishes that feature the best of local produce. Tapas are also popular here due to the region's proximity to Spain. This is also a wine country: don't leave without sampling the excellent red and rose Cabardes wines.